While walking down by the intermittent stream in the woods this week, I caught a flash of movement out of the corner of my eye. I turned, but didn’t see anything at first. When I stepped in the direction of the flash, it happened again. This time I saw it – it was the quick escape leap of a tiny northern cricket frog, Acris crepitans. They are among our smallest vertebrates, with adults barely reaching 1.5 inches in body length. But they are great leapers for their size, jumping up to three feet when startled. 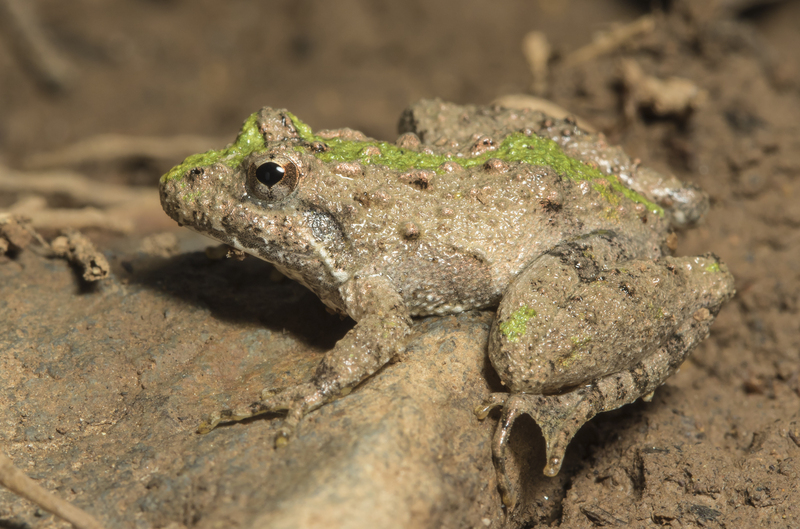 Northern cricket frogs are widespread in the Eastern U.S., ranging from northeastern Mexico, up to Wisconsin, and east to the Atlantic states. 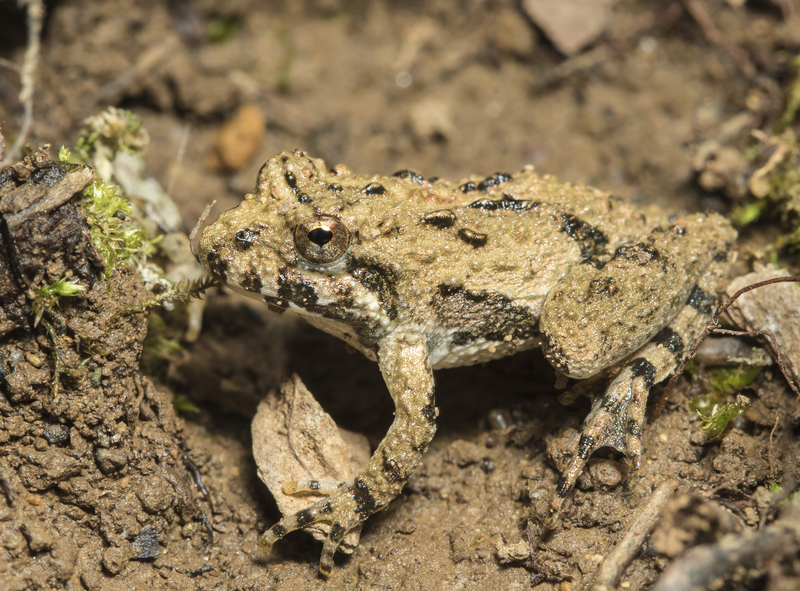 There are actually two species of cricket frogs in North Carolina – the northern, which is mainly in the Piedmont, and the southern, more typically found in the Coastal counties. They are similar in appearance, both being small, cryptically colored frogs, with long, slender hind legs, and a warty appearance. Most have a distinctive darkened triangle pattern between the eyes, and a Y-shaped line extending down the back. 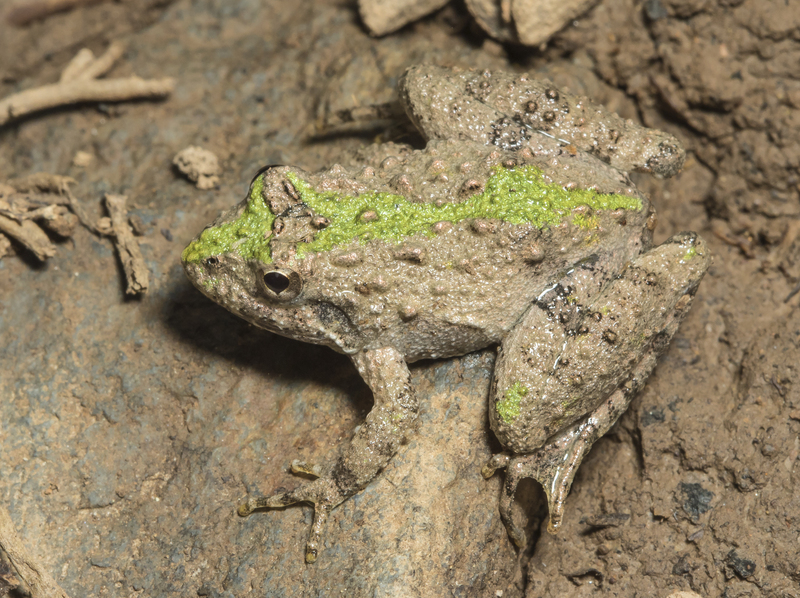 Throughput their range, northern cricket frogs exhibit variation in color, with the dorsal stripe being either primarily gray, brown, reddish-brown, or green. The one above seems to be primarily brown with some hints of reddish-brown in some of the warts. A few yards away, I came upon another cricket frog, this one with a noticeable green coloration in the dorsal Y-pattern. I looked up the topic of their color variation and stumbled on a host of scientific papers dealing with this phenomenon in cricket frogs, known as color polymorphism. Various theories have been proposed and tested throughout the range of this species. And they have come up with various reasons for the color differences: visual selection by predators directly determines color proportions (the theory being that those that blend in better with the local surroundings are better concealed and therefore survive better); another thought some color morphs correlated better with local substrate color but are more resistant to desiccation in certain habitat types; and yet another study disagreed and suggested natural selection may favor some behavioral characteristics associated with a particular morph. I finally found one Illinois study that did some comparisons with other data and concluded that different factors must operate throughout the species range to maintain this color polymorphism. The author states that chance may be a major factor in determining color morph proportions in localized populations. Perhaps the frogs know something about color variation that we just have not yet discovered. Whatever the reason, I always enjoy seeing one of these cryptic creatures leap and disappear into the background. And, I look forward to the start of their breeding season, accompanied by their clicking calls, in a few weeks. 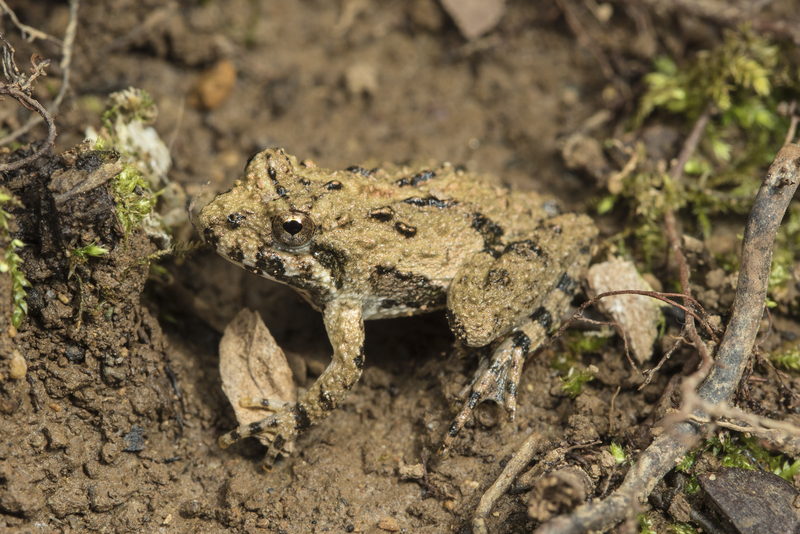 This entry was posted in Natural History and tagged northern cricket frog by roadsendnaturalist. Bookmark the permalink. Very informative narrative of the cricket frog. Thank you for this interesting piece about a frog I’ve never heard of. The colour morphism is fascinating. Your pictures are excellent as usual. I always love the Cricket frogs and all their colors…you got great photos of them..right down to their slightly un-frog like skin.